First impressions are everything with a video game. If you do not catch the player’s attention within the first few minutes, you might lose them. I think we have all played a game that had a rough first impression, but turn out to be a great game. For example, the 2010 Splatterhouse reboot had a rough start, but I ended up enjoying the game. I know a lot of games like to start out slow, and that is fine, but you have to keep the player interested. So, why do I talk about this, and might talk about why first impressions are so important in the future? I say this because that is what you need to know going into the PlayStation 3 indie game, Strength of the Sword 3. (By the way, there is no Strength of the Sword 1 or 2. Just thought I would save you some time and sanity.) 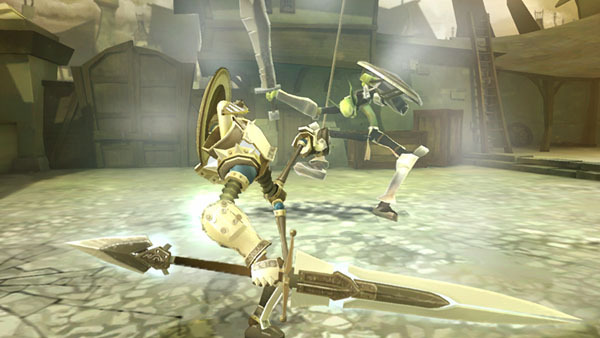 It has a rough start, but once you get into the game’s unique combat that reminds me of the combat system in Dark Souls, you will have a pretty fun and challenging action game that is easily worth the $5 dollars it cost to download. Let’s dive into what this game is all about. The story is very paper-thin, and there isn’t much to it. Basically, a bunch of demons have risen from Hell to cause chaos and death across the land. You play as a knight from what is essentially Heaven, and it is your task to take down this evil force and save the world. Like I said, the story is very nonexistent, but it is not very important to the overall experience. It is kind of a bummer that we still have games that focus more on one thing than the other, but this is one of those games that you can let it slide about not having a story, since it is all about the gameplay. 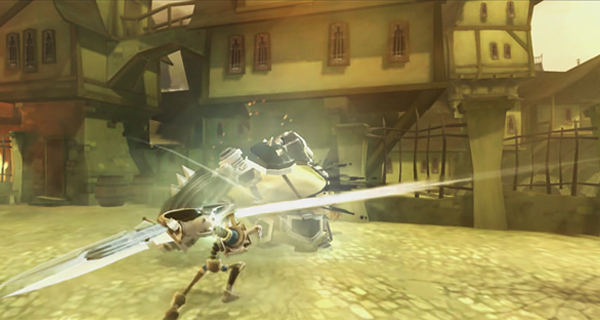 Strength of the Sword 3 is an action game, but it isn’t anything like God of War or Ninja Gaiden. The combat is designed to be more strategic, where you need to time your attacks, and not just mash away on the attack buttons. The enemy AI is actually pretty smart. It will dodge, block, and attack you, and will get smarter while studying your plans of attack. This means you cannot just use the same strategy twice on the same set of enemies. For example, the goblin enemies you fight at the beginning of the game will be a lot tougher in later levels. Your move set is simple and easy to get into, you just have variations of stab- and-slashing attacks. You will have to take into consideration that you have a spell bar, a quick refueling stamina bar, and a shield bar that will deplete when you do things like dodge, dash, take damage, etc. When you beat a boss, you can choose to get a new sword or shield that will have different properties, like a shield having more defensive abilities or a weapon having a strong set of moves, but the move list is limited. Luckily, you can go back to earlier levels to try out new weapons, so you can try out the different weapons and shields yourself to see which one fits your personal style of fighting. You will also gain sub-weapons and items to help you out in battle, like throwing knives, a flamethrower, health and mana items, and you get the idea. The game is very short, about a few hours, but with how difficult this game can be, and trying out the different combination of weapons and moves, you can add two or more hours on top of the total time it takes to beat the game. I like the art style in the game. The graphical presentation has a lot of personality, and it reminds me of something from Tim Burton. The music reminds me of music you would hear in gladiatorial combat, which means it’s epic and intense sounding, which fits the situation since the battles can be epic and intense. There is no voice work, but I do like the little cut scenes that play after you beat a boss. Unfortunately, this game of clashing steel has its issues. The camera, while not downright terrible, can get stuck behind background objects, and it can get in the way of fighting enemies because of that. I also found the game to be slightly repetitive, since all you are doing is going through arena-style levels and having to survive three rounds of enemies. I would have loved the levels to be more connected, or have something to break up the intense combat. There is also no multiplayer, which is a shame since this combat could make for some great online battles, but since the team behind this game is only like two people, I can understand why they didn’t add this feature into the game. This game was honestly an impulse download off the PlayStation Network store last week, and it is by far one of the best downloadable exclusives you can get on the PlayStation 3. It might have a few problems, and I can see certain people not liking this game due to having more tactical combat than something fast-paced and button-mashy, but for only $5, I can highly recommend it for a few tough, but ultimately satisfying hours of combat. I hope to see more from the developer, IVENT, and I hope their next project works out for them!